See size chart in product image or down below. Amazon provided "Size Chart" is different and incompatible. Please refer to the size chart below or in the product image. Amazon provided "Size Chart" is different and incompatible. 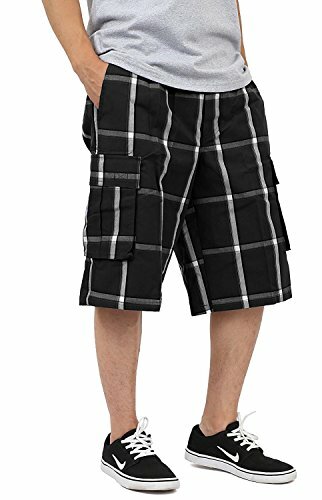 Designed in Los Angeles, the Mecca of streetwear fashion, Shaka Wear Plaid Cargo Shorts are a modern and casual streetwear essential. Elastic waist adds comfort and simplicity to the style. Loose fit allows easy baggy styling and provides extra level of comfort. Please refer to the size chart in product image. Durable and convenient side pockets with secure velcro closure and double stitching makes carrying your everyday carry items safe and easy. If you have any questions about this product by Shaka, contact us by completing and submitting the form below. If you are looking for a specif part number, please include it with your message.